What most people don’t know is that a true lab-grown gemstone is not an imitation. In gemmological terms, a lab-grown gemstone is one that has a direct natural counterpart but is grown in a laboratory. Within limits, they have the same physical, chemical and optical properties as natural gems. In some instances lab-grown may be your only option when the real thing is unavailable or can only be acquired from ethically unsound suppliers. A laboratory-grown gemstone is the same as its natural counterpart, just created in a different place. Most popular (and relatively expensive) gemstones – including diamonds – have lab-grown alternatives. Why choose a lab-created alternative? Well, the proposal went perfectly as planned and she said yes!!! She absolutely loves the ring and it’s already proving to be very popular with everyone who sees it. She particularly loves the pineapples!! And of course she loves the entire concept of ethically produced jewelry, she loves that too!! Thank you so much for your input and work with creating the ring, and please pass on my satisfaction to Chris – he’s done amazing work and it’s something we’ll both cherish for a very long time!!! Moissanite* is the most popular synthetic gemstone we sell. Because of its colourlessness and sparkle, it’s often chosen as a diamond alternative, but is also loved in its own right. 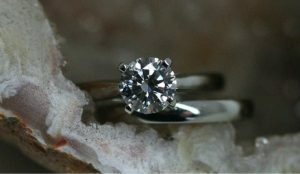 *Whilst not a plentiful natural gem, natural moissanite does exist, albeit in a greyish form. If you want the bling effect without the bling budget, moissanite can fit the bill. A one carat diamond equivalent (6.5mm round) can be yours for less than $1000*. That’s not bad when compared with a $10,000 starting point for a good quality (recycled) one carat natural diamond. Argyle and Canadian diamonds are even more expensive. We offer Charles & Colvard Forever One™ colourless moissanite. *Price refers to the gemstone only. Metal, manufacturing, engraving and other jewellery elements cost extra. 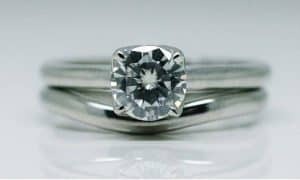 Whilst still far from mainstream in Australia, lab-grown diamonds are starting to get some traction in the ethical jewellery world. If your heart is set on a diamond, but your wallet and ethics aren’t on the same page, then this may be the thing for you. Lab-grown white diamond, round brilliant cut, set in a recycled platinum band. Shown with a matching wedding ring. Laboratory-grown diamonds are, for all intents and purposes, identical chemically, physically and optically to mined diamonds. Importantly, they have a much smaller carbon footprint and, unlike many mined diamonds on the market, they can be traced to their origin. If you’d like to know more about what’s going on in the market, take a look at our recent blog post on the subject. If you’d like to see a direct comparison between a lab-grown and mined diamond, check out this article. There’s quite a variety of synthetic gemstones available these days. And whilst they’re not everyone’s first preference, often limited availability and poor quality of the (affordable) real thing make them the best option. Synthetic sapphires are available in blue, pink, orange and yellow. Laboratory grown sapphires are bright and clean looking and are available in many shapes including, round, square, heart, oval, emerald, marquise and pear. Sizes start at 2mm. Price-wise, a 6mm round blue synthetic sapphire starts at around $570. 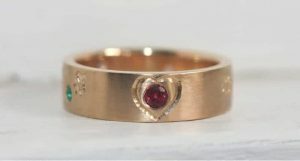 Fine quality rubies can cost more than diamonds. Synthetic rubies start at 1.75mm and can be found in sizes up to 8mm. A 6mm round lab grown ruby starts at around $620. Natural emeralds are in extremely limited supply as an ‘ethical’ gemstone. 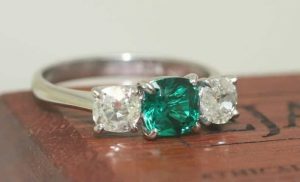 We haven’t yet found a reliable source for this gem type, so at the moment all we can offer are either recycled or synthetic emeralds. The classic ’emerald cut’ is an octagon with cut corners. Emerald cuts range in size from 5 x 3mm (around $130) to 12 x 10mm (around $3,300). Round emeralds are available from 1.5mm to 8mm (from $20 – $900). Alexandrite is a very rare and expensive natural gem. Genuine alexandrite changes colour from green to orange. The synthetic variety changes from purple to green. Natural gemstones are often substituted with synthetic colour change sapphires. 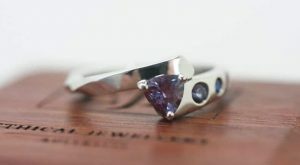 Alexandrite is also a gemstone to buy with great care. If you’re looking for the real thing, find a trustworthy gem dealer. Synthetic varieties are available between 2mm and 8mm (from $20 – $1200). Spinel is an underrated gemstone. It is robust enough for everyday wear and the natural variety is available in a wide range of colours. Synthetics tend to be an aqua blue. Quartz such as citrine and amethyst are plentiful and quite inexpensive. We don’t usually offer synthetic versions. Synthetic opals, on the other hand, are not a good idea. Let’s not go there. If you would like to create an engagement ring or other jewellery piece with a laboratory made diamond or gemstone, contact us today. Feel free to visit our gallery to see more of our handmade jewellery.